Breathe new life into your pool, patio, or yard with the gorgeous Whelan Gazebo. The rust-free aluminum frame with a powder-coated black finish ensures this gazebo is built to last. With the Whelan Gazebo, you can focus on enjoying your time outside instead of on maintenance. The frame features an elegant scroll pattern that runs along the valence and the top-tier of the roof. This gazebo has full mosquito netting with zippers. And, the cream coloured banding to secure the brown netting lends even more sophistication to this beautiful gazebo. With this gazebo you can easy transform your patio or garden from something simple to fashionable. This gazebo helps to create a relaxing, shady oasis, where family and friends can enjoy the outdoors! You'll appreciate the eye-catching soft canopy top that contrasts the beautiful black frame, adding more dynamism and beauty to your outdoors. Place it next to your pool or home garden for an inviting centrepiece. Besides its highly durable frame and stable structure, the gazebo is convenient for self-setup. So, kick back and relax under this well shaded gazebo. 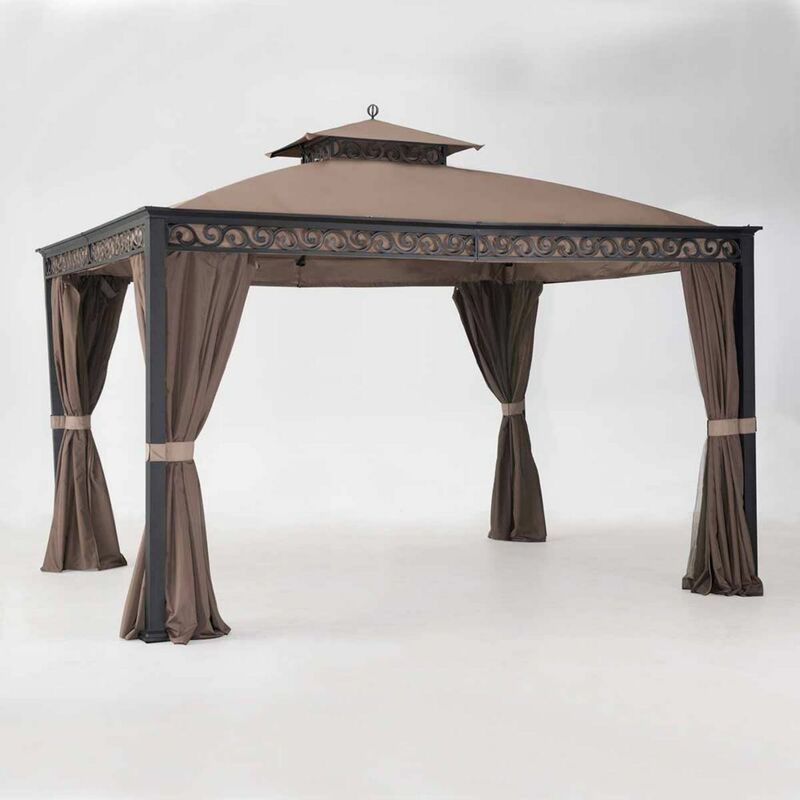 Whelan 10 ft. x 12 ft. Gazebo with Mosquito Netting in Black and Brown Breathe new life into your pool, patio, or yard with the gorgeous Whelan Gazebo. The rust-free aluminum frame with a powder-coated black finish ensures this gazebo is built to last. With the Whelan Gazebo, you can focus on enjoying your time outside instead of on maintenance. The frame features an elegant scroll pattern that runs along the valence and the top-tier of the roof. This gazebo has full mosquito netting with zippers. And, the cream coloured banding to secure the brown netting lends even more sophistication to this beautiful gazebo. Whelan 10 ft. x 12 ft. Gazebo with Mosquito Netting in Black and Brown is rated 3.4 out of 5 by 10. Rated 5 out of 5 by Walka from Looks great all set up, really like it. Set up was time consuming, there were so many parts! Looks great all set up, really like it. Set up was time consuming, there were so many parts! Rated 5 out of 5 by NOARC from Great Buy Bought this product in May, great purchase, my husband ensured the gazebo was anchored down as it should be in case of high winds. We recently had severe winds that picked up our neighbours gazebo and sent it over our six foot fence and toppled on the top of our gazebo. It destroyed our neighbours how ever ours received little damage. The frame on top was bent slightly and they are assisting in getting the parts to replace them. I highly recommend this product, Make sure you anchor it to the ground, no item is going to stay down with strong winds and the coverings on it! Proper assembly equals long lasting gazebo! Rated 1 out of 5 by Nick from Worst Purchase Ever! I have had 3 gazebos that all broke all from Whelan. All were weather related, the slightest wind whipped it over a 5 ft high fence and ruined it. The most recent was put up last sunday and destroyed on Wednesday with slight winds. I would not recommend this product for anyone, especially on the east coast. Waste of $800. Never again Whelan! Rated 5 out of 5 by mcfflyer from We were looking for a patio cover . . . As we transform this house into "our" house, one thing I wanted was an outdoor living space, something this house didn't have. I saw the fabric patio covers from several sources, but my wife and I decided on this one from HD even though it was more expensive than others, we liked the design and looks of it all. And so, sight unseen, we ordered it from our local HD. It arrived there on time, I had help loading it into my van, and we took it home. After we had the new patio poured, I started assembling the patio cover frame, with help from my wife to put the two halves together and stand it up. When up, I used a hammer drill to drill holes in the concrete to anchor it down. Living in northern California, without any summer thunderstorms or other storms, I knew this would be up for the entire summer without any worries of any weather damage. Once up and anchored, only then did I put the fabric cover on. We love the cover, and love the HD patio furniture (Martha Stewart Charlottetown collection) under it. Now we spend a lot of evenings outside. As for the cover, we really like it. Putting it together was pretty easy, although the instructions were lacking in explaining how to put on the cover. First of all, at one stage, it instructed you to put the cover up on the framework, but not to stretch it out. What it didn't say is that you had to unfold it completely, and then place it around the top cupola opening before putting the cupola on. Also there should be some instruction on the cover itself, suggesting having the cover heated up some, as it takes a lot of work, strength and grip to stretch the cover to get the hooks into the anchor holes. I could barely stretch it to get it in the final hook anchored. But the final result is that it looks terrific, and its up for the summer. The next test is durability. We have blazing hot summers in Sacramento, and my plan is to remove the fabric in the fall and store it all winter. However, it will be interesting to see how well that fabric roof survives and survives for how many summers. I'm thinking of purchasing a replacement cover to keep in reserve, as I intend this patio cover to last for years! Rated 4 out of 5 by DLSayville from Great size, nice curtains - frame quality lacking One post arrived with the holes drilled in the wrong spot. The thickness of the metal all around was much less than our original Sunjoy. Love the rain curtains, netting and new dome shape of canopy. Rated 1 out of 5 by Cyrus from Completely fell apart during 15mph winds I paid 200 to have a professional build this Gazebo after we got it from home depot. It looked amazing though I was somewhat concerned about how light the legs were. Well after our first wind of about 15mph (im in los angeles) this thing completely ripped apart. the bolts actually ripped out of the legs and you could really see how flimsy and poorly this thing was built. I'm out 200 now but I was able to return the heap of metal and cloth that this left me with back to home depot. never buying a whelan product again. can the curtain be purchased at the same time? Cost? The Curtain and Netting are on separate tracks and can be moved individually.